I’m working on a new game. It’s going to be a small game. Well, I have a few files with the design heart in it. It is the spiritual offspring of Adventure Fantasy Game and Mageblade, with some bits and bobs added here and there that should have been more of a thing ages ago, like non-binary success, simpler spellcasting and more reliance on stats and less on of modifiers. The focus for the whole enterprise is to release a game that is kind of old-style, but most importantly with clean mechanics. Clean because I realized that overall a clean and straightforward design that makes sense to beginners is more important than any other pet rule I might want in. So I’m putting in some mechanics that worked well in playtest, and some other that are just leaner that the alternatives. Some old cruft got thrown away, a bit I kept because of compatibility’s sake, and some new shiny things are in. It’s going to be small, but complete. As in, probably one or few slim booklets, with a base game and a smattering of advanced players’ options, a few dungeons and a sandbox. I’m still on the fence as to whether add a “how you run this game” section or not. Who knows. On Google Plus we had a small discussion about the last post. Nags were found. Here come fixes. The first nag is that if you have multiple attacks per round and your target is hard to hit, you get more penalties. Which is true and a problem. If you use such a system, I advise ignoring all the negative effects from missing the target, but if you want you can keep “deal half damage missing on a 1” and “deal 1d3 missing on a 2”. Just use the table above, looking up the natural d20 result on the table if you hit. Apply the damage modifier from the table to a single damage die and then convert that to SH damage. I will playtest tonight with a newly rolled Fighter and amend the post with the results. AFG does not use a d20. But it has 2 completely different combat systems. The adaptation therefore works this way: the result that guarantees a hit to both newbs and experts is the one that does no extra effects, with other results that are successes only for more experts deal progressively more damage. For example if you use a d6 and you hit with high numbers, 6 will deal no extra effects, 5 will have some extra damage, etc. Some of these results give an extra damage die, to be treated as all the other extra damage dice. If the character knows Secret Fighting Techniques that require activation, they can activate them foregoing this extra damage die. FIGHTMORE might make you roll for melee multiple times per round. So for the purpose of modifiers just consider the roll used to potentially hit someone and not the defence rolls. If you roll once per round (for example using FIGHTMORE MAYHEM) then just use that roll. On a Draw, deal damage normally, counter with a shield as usual. On every other result, use the 5MAIL table above. I might release a proper old-style CRT (Combat Result Table, like in old wargames). 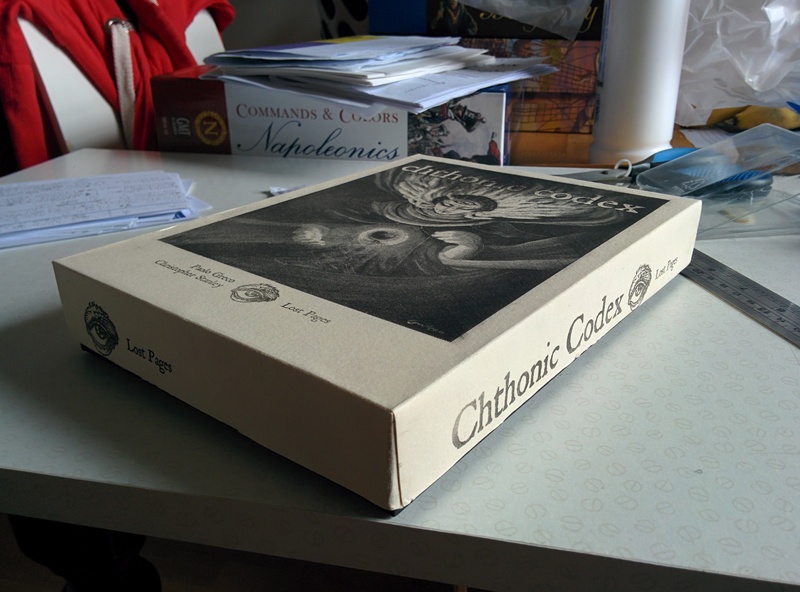 Whitebox for Chthonic Codex: pretend Q&A and mo’better box pictures! Hey Paolo, how’s Chthonic Codex doin’? Progress! I just put together the second last test box, using a bad test print I had lying around. What’s wrong with the lid? and why did you order the boxes? The plate got scratched. And was done for a deeper lid, the new lid is slimmer, so the new plate will have to be etched based on the new box. No biggie, heh. I ordered the boxes from a local supplier as I was not happy with going for a fully handcrafted boxed set. Well I was happy with them, but maybe the customers would not be completely happy. Dice for scale. They’re a mixture of Gamescience, Citadel/GW and Chessex. And now, with the contents out. Also, ruler for scale. AFG is inserted in lieu of Mysteries and Mystagogues (AFG is almost twice the pagecount of CC:MM, btw), as I do not have yet a CC:MM book with the real cover. I got feedback from the first reviewer/proofreader though, so we are very close to printing a big stack of them. Oh, it’s a foam insert. 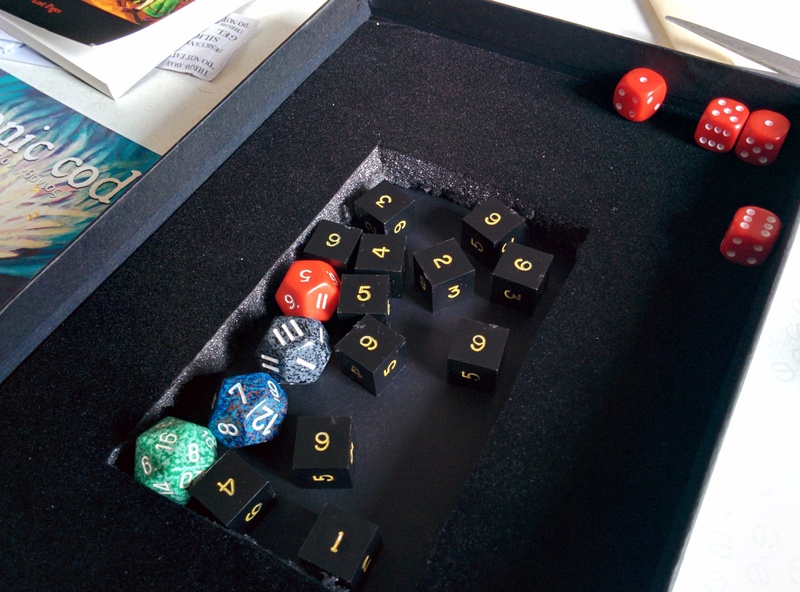 I carved a big slot for dice, so they do not rattle around the box. The boxes will be shipped with no dice, and with no slots in the padding. You can carve it in whatever shape you need to hold index cards, dice, pencils, votive images, whatevs, or remove it to keep more handbooks in it, like AFG or S&W Whitebox or even, I dare to say, D&D. Why do CC:CC and CC:AA look different? Sup with Mysteries & Mystagogues? Work continued even while I was in Japan, because bullet trains make for good offices and, while they’re fast, Japan is a very long country. I only need to transcribe stuff in, finish the layout (too many herons, not enough axolotls) and bring it to the printer. Vancian magic has its place. But it’s not always appropriate, nor it needs to be the only magic system in your setting. Sometimes you want something more flexible, less mundane and more based on fairytale logic. More meaningful choices and deeper consequences. Chthonic Codex takes the AFG magic system (available in the free AFG preview downloadable here, explained in section 1.2.1, pp 10,11 and already usable with other retroclones) and adds some, urm, bells and whistles of the arcane variety. The results are usable with all of them old school games you love. Level: 0. Range: 1’. Casting time: 1 turn. Duration: instantaneous. The caster uncannily receives insights and visions enabling them to identify and understand one arcanum, an unknown function of the chosen arcane item or phenomenon within rangeIf cast on a grimoire, the caster will be able to identify a chosen spell from the source. The caster can then learn and transcribe it if their levels are compatible. If cast on other items or phenomena, the weakest unknown function or detail of the object or phenomenon will be understood by the Caster first, with more details conveyed on subsequent castings. Dispensation – the caster has to sleep at least 1d6 hours with their head close to the arcanum to be unveiled. Comfy pillows can be used, but not overly thick. A dispensation is a condition that, if satisfied, lets the caster cast the spell without spending mana. In retroclones, the dispensed spell can’t be cast more than once a day, even if memorized. So, there you go, casters have a way of casting spells that they haven’t memorized, but it usually involves dealing with spirits, whispering to fishes, gilting doors and other awkward actions like choreographed singing and dancing montages. The next concept is Alteration. The spell can be cast in more than a single mode. I’d also love to expose you to Metaphorurgy, the discipline of magic dealing with thresholds (both mundane doors and magic portals) which the Gatekeepers hold dear. Level: 1. Range: touch. Casting time: 1 phase. Duration: 1 turn. This simple spell folds a door frame over the caster’s time continuum. The door will open on the first threshold the caster went through since last sunset. Alteration – by smearing 1 hit point wort of blood on the door, the door will open instead on the first threshold the blood went through since last sunset. Alterations are not only a matter of flexibility, nor they are a new concept. Reversed spells are alterations. What I’ve done is framing the alternate version in a more explicit form. It’s also interesting to note that since in AFG casters can’t cast a given spell more than once per day, a spell with an altered form can’t be used once per form, but only once. In this way they resemble the alternate spells in the AFG handbook. Why alterations and not having different spells? First, it’s a matter of meaningful choice: if a character could cast 10 different varieties of the same fireball in a day to avoid the limitation, it would run in the face of the core design of the mana system. Second, you’re giving more flexibility to players, which means more choice. And I like choice. Third, because buying a book to read the same spell over and over again with tiny changes really ticks me off and it’s something i do not do. Level: 1. Range: self. Casting time: 1 phase. Duration: until dawn. The lower limbs of the caster change into the hind legs of a goat, making the caster look similar to a bocklin from the waist down. The legs bestow on the caster caprine surefootedness, meaning that the now irsute caster will never fail to climb on any natural surface. Apprentices are encouraged not to try this spell on the giant pile of elven skeletons: while the climb is certainly not a problem under the effect of this spell, some of these long-dead elves are extremely cantankerous. Dispensation – roll for Essence Corruption (weeks). So, the spell can be cast for free, but if the Essence Corruption save fails the spell wears off but the effects last 1d6 more weeks. Essence Corruption lasts 1d6 time units as specified, the time units being: rounds, turns, hours, days, weeks, months, years, forever. The next time essence corruption is failed for the same spell the time unit will be bumped by one on this scale, the second time by two, and so on, until the magic is gone but the effects are permanent. There are rumours that essence corruption might be liftable, as a curse, but they are only rumours. Sure, you can change shape into an eagle or a dolphin or a giant bird-demon or a greater asphaltomorph, and you’re good enough to do it without spending mana. But doing so you’re trading a bit of your soul for something else. And it’s not only for metamorphoses: other kinds of magic corrupt your inner spark as well. My three-weeks-long trip through Europe (Glasgow-London-Paris-Lausanne-Milan-Hamburg-Berlin-Glasgow) is now finished and I’m back at work. There’s been progress with Academia Apocripha and Mystery & Mystagogues and Secret Santicore Mobile but since I spent two of the three weeks with an on and off sinusitis progress is less then expected. Sadly the Mystagogue of the Bridge of Bones was not available, so i spent a few days being completely useless but eating like a pro. Anyway, school design and writeups are at a good point, more schools and more spells have been added. The count at the moment is 8 or 9 schools: the Great Schools of Necromancers, Chimerists, Fire Dervishes, Gatekeepers, Stargazers, plus the Great Workshop, the so-called School of the Unseen (which might be a yet-unobserved school of illusion, a school posing to be a lie pretending to be a school in hiding or might not even exist at all), the Chthonic Craft practised by Hypogean Ascetics, and possibly the lost School of Pharmacy (why lost? good question). Each school comes with 13 new spells, except Necromancy and Pharmacy which have the full panoply of AFG necromancy and physiurgy (that’s healing for you) because these spells are kind of needed anyway. If I have time I might even “schoolify” all the AFG magic disciplines, bringing the number of schools to, erm, between 11 and 14 depending on how I feel about having these Moon Hunter weirdos and the arcanaluddite Troll Spellsmiths. And human sacrifices for demon-god-worshippers and their Goetia spells. Even if I don’t schoolify them all, we are talking of about 150 spells, half of them new, the other half from AFG, plus special a few game mechanics specific for every school, like the Elixirs from the School of Necromancy. And there’s gonna be also other stuff. I expect the PDF for CC:AA to be ready in January, and CC:M&M in February. Bookbinding and box-making to happen in March, shipping as they come ready. Spelunking Ferrets are specially trained LVL 1 ferrets. They are unnaturally quiet and letargic and usually do not move much at all. This changes when they are thrown at an opponent: they will attack and, after hitting, they’ll latch in and bury in the victim dealing damage every turn. They can also be inserted in a willing subject, usually through the mouth, but they are also happy with other body cavities, or even with creating new body cavities. There they will dig, extract and devour any external body like internal moulds and oozes, uncontrolled growths, eggs, half-digested godlings, resident squids and extra souls. In the process the ferret will deal 2d6 damage to the suffering patient, and then probably die of indigestion. Scapegoats are goats kept in sacks. When someone is to be blamed or about to suffer a curse or a mortal wound, the goat will instead suffer the consequences. The scapegoat can also be given away to someone to temporarily avert their wrath. Bagging goats is a very dangerous fine art practiced only by the most adept Savants, but it’s said that it’s common knowledge between Hypogean Hermits. What’s certain is that the mysteric ritual involves naked chanting the Stodgy Selenic Song under the open sky and must be completed before dawn, and that a captured goat is required. The goat will not survive more than a week in the bag, a month if properly watered. After more than two weeks of traveling I’m here at my parent’s in Milan. I have a mind-numbing cold that makes me really really stupid and useless, and my back has been in flaring pain for a week. Work on Santicore has slowed down a lot (because sleeping all day makes my existence way less awful) and I won’t manage to ship it by tomorrow. BUT I will try to release the parts that are done-ish. Anyway, here’s a partial list of powers that might or might not be related to… well, I can’t say. 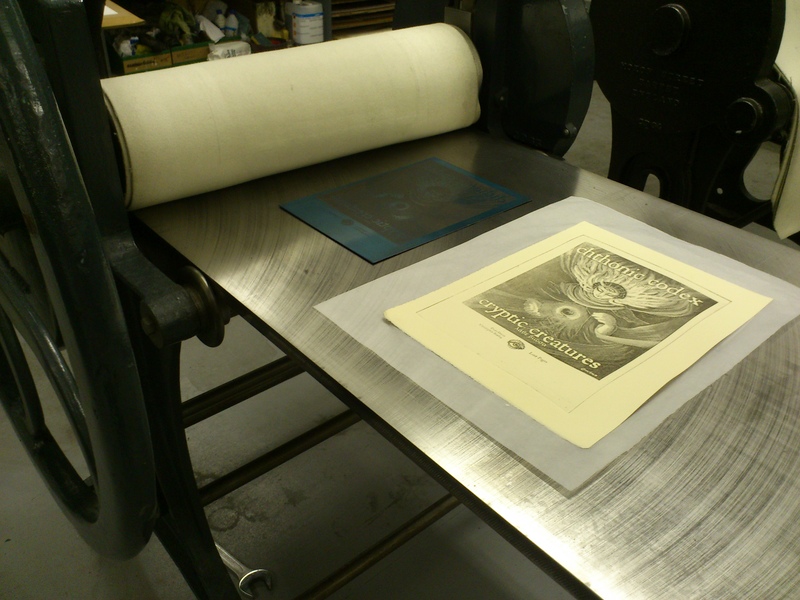 But they might be related to Mysteries & Mystagogues, the third book of Chthonic Codex, due in early 2014. These powers are learnt separately and through strange rituals, and the character does not necessarily know beforehand the name and effects of the power. Wizard Eyes: the character can see what others can’t. Spirits, auras, negativity, fear, love, and sometimes even other people’s problems. While this is incredibly useful, it’s also incredibly distracting: apply a +1/-1 modifier to all attempts to surprise the subject. Polypogenesys: the character spawns a squid. The squid lives inside the subject and, as long as it’s inside, they can communicate telepathically. It can be commanded to leave and fight for the host. The squid is literally spawned by the host and will die if not allowed back in the host through any orifice at least once a day (a freaky process to watch, but totally harmless). If the squid dies a new squid spawns in two months. The Theurge who Stares at Goats: the character can intensely stare at a goat to stop their heart. After a full round of staring, the goat must save or die. Skyclad: while the character is under the sky and completely naked, except for headgear and jewellery, the sky will be their aegis. The character can’t be paralyzed, petrified or held and is protected by claws and weapons (Protection: Light. AC 5). Hieratic Alignment: the character is now widely known within an in-group and treated as if it was one of them. The character also enjoys their friendship and camaraderie. Such groups could be something like “Bocklins”, “Necromancers” and “Horned Kataracts”. The in-group expects the same behaviour from the character, of course. Caduceus: the character can bind a snake to a staff to form a caduceus, a staff with healing powers. The snake can save to avoid being bound. While bound the caster can spend 1 mana point to transfer the snake’s preternatural healing and regeneration to a touched ally, healing 1d6 damage. This can be done once per day per level of the snake. The snake can also be cast off the staff at an opponent; after the ensuing fight the snake considers itself excused and will slither away. Binding a recently excused snake is considered a terrible faux-pas. Naiad-friend: the character is really, really close to a naiad. Like, really close. The character can get the help of the river-spirit by stepping in any flowing body of water somehow connected to the sea and calling for her name. The naiad will arrive after some time, an interval reduced to under a minute (1d6 rounds) if called in her own body of water. Naiads are known to show up at the last minute to save their friends from drowning and other horrible water-related deaths. The naiad will always expect some kind of nice gift or quality time from the character, or will start to stalk and annoy them to no end. The Sphenoid Procedure: the character can spend one turn sensing the direction of the closest magic item. While doing so they will profusely bleed from the nose, taking 1 temporary damage. Shroud of Nox: while fully coated with pitch or black ink the character can reroll a failed save once a day. 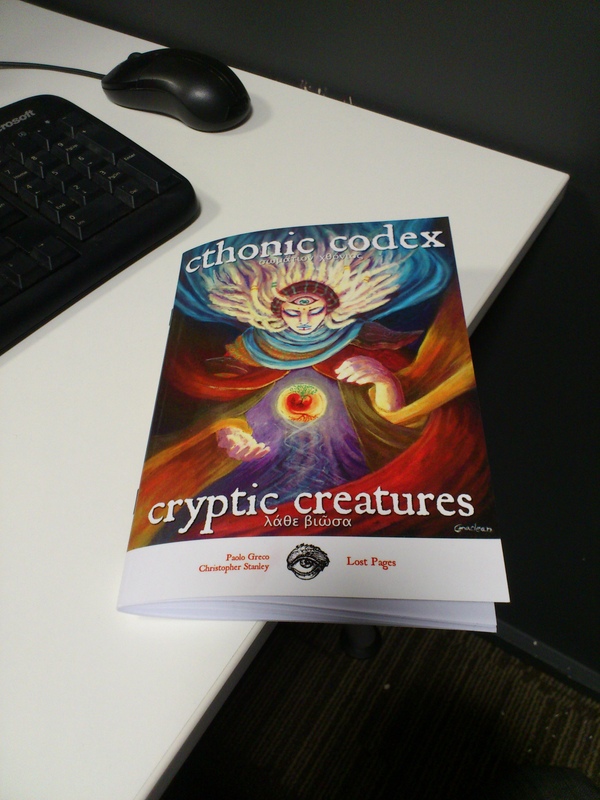 Today it’s the release date for Chthonic Codex – volume 1: Cryptic Creatures. and Pergamino Barocco, paperback edition. The PDFs will be shipped from 9PM GMT tonight (4PM EST), the print copies from next week onwards. Due to the approaching festive season, the sooner you place orders, the sooner you will receive the books. Do it too late, wait for January. Mind you, I need to process all orders by hand, so ordering a PDF means having to wait a bit. Chthonic Codex – volume 1: Cryptic Creatures: the first volume counts 64 pages of fragments from the recently recovered Chthonic Codex, the monstrosities illustrated by Christopher Stanley. It’s the monster manual of the Chthonic Codex setting, as well as being a stand alone monster book for Swords & Wizardry and other retroclones and Adventure Fantasy Game. It will be followed by two more volumes (Academia Apocripha and Mysteries & Mystagogues). It comes in PDF, Print + PDF and three limited editions: Boxed Set + PDF, Codex Edition and Boxed plus Codex Edition. Note: the limited editions will be shipped in early 2014 and include all the content from the three books. Plus more. I’ll try something different in the development process and will share drafts with who opts for a preorder. Updated versions of the PDFs will be distributed as they are developed. Codex in the wild: the cover by Claire Maclean is something I’m extremely proud of. Also, tangentially related: printing by hand is effing awesome. Pergamino Barocco, paperback edition: PDF or Print and PDF! The Pergamino is a bit of a weird beast. And it’s going to be printed in two different paperback editions, depending on supply. Delivered to you in a variety of covers, bindings and paper. If you need more details about all the released products, have a gander at the Lost Pages website. Comments below or on Plus.